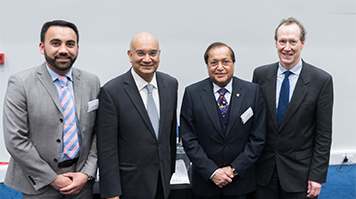 Keith Vaz, MP for Leicester, and global entrepreneur Dr Rami Ranger spoke about leadership and entrepreneurial success at yesterday’s inaugural Dr Rami Ranger CBE Enterprise Lecture. The event brought together LSBU alumni, students and staff, as well as entrepreneurs, local businesses and south London school children. In his keynote speech, Mr Vaz spoke about the importance of good leadership to entrepreneurship and business practice. Dr Ranger shared his personal experiences and insights of starting a successful company and the qualities he feels all entrepreneurs need to prosper. “I am indebted to London South Bank University for allowing me to share my life's journey with others who may be in a similar situation as I once was. We both feel that by sharing stories such as mine, we can encourage others to face challenges which fate throws at us from time to time,” said Dr Ranger in his address. This lecture was the first in a series supported by the Dr Rami Ranger CBE Enterprise Excellence Fund, which Dr Ranger generously set up at LSBU in 2014. LSBU’s Entrepreneurship and Innovation Institute has since used the fund to deliver programmes and activities that support students and recent alumni to develop their enterprise skills and achieve entrepreneurial success. “At LSBU, we are committed to fostering a community of enterprise that supports and inspires our students and graduates to embrace their potential. This lecture is another great opportunity to celebrate enterprise with our students, staff, local businesses and esteemed partners like Dr Ranger,” said Gurpreet Jagpal, Director of Research, Enterprise and Innovation at LSBU. Dr Ranger’s contribution also led to creating an Investment Fund to support existing student and graduate ventures, as well as establishing entrepreneurs in residence at the Clarence Centre for Enterprise and Innovation. The University also set up a hub and workspace for recent alumni start-ups on our Graduate Entrepreneur Scheme.